One thing mysteriously absent from Corsair's all-in-one (AIO) cooling solutions has been RGB lighting. Nearly all major brands offering AIO liquid cooling options have added some form of lighting paired with mediocre control software. 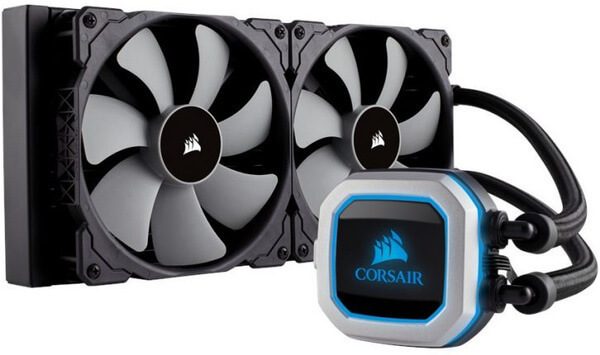 Now, Corsair has plans to introduce two new liquid coolers to fill in the gaps. The H115i Pro and H150i Pro will both ship with RGB lighting with 280mm and 360mm radiators respectively. To differentiate Pro models from the existing products available, Corsair is likely to use its ML series fans with magnetic levitation bearings. Each of the two 140mm fans on the H115i Pro will spin up to 1200 RPM pushing 55.4 CFM while producing 20.4 dB of noise. The H150i Pro fans are rated for 1600 RPM, can push 47.3 CFM, and will produce 25 dB of disturbance. The H115i Pro has an estimated retail price of $139.99. Moving up to the 360mm option is believed to cost $159.99. As processor core counts increase, power draw on many-core CPUs necessitates high end cooling in order to overclock or even just prevent thermal throttling. Intel's i9 7980XE could be the perfect candidate for a 360mm radiator given its absolutely massive power draw when pushed to its limits. For enthusiasts with more reasonably priced processors, there may be no need for a massive 360mm radiator, but reduced noise is always welcome as is improved aesthetics. Availability has not yet been announced, but CES 2018 is a likely contender for the unveiling of these new coolers. Not a bad price if it performs as advertised. Anyone out there had experience with them? Any drawbacks? 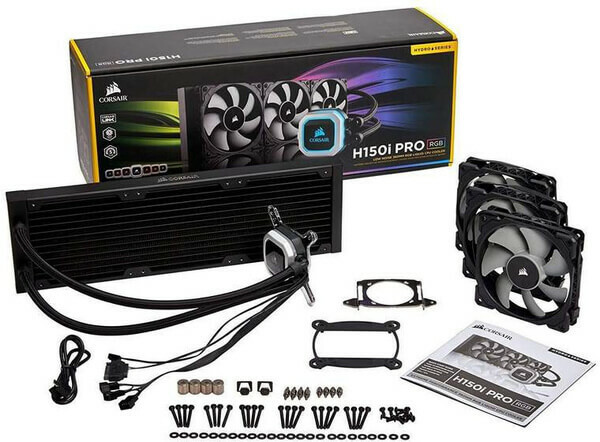 That H150i would make a great replacement for my H100i when I next upgrade. Meh. I bought their 100iV2 and the fans got so amazingly loud without pushing much air through I replaced them with these (https://www.amazon.com/gp/product/B00650P2ZC/ref=oh_aui_search_detailpage?ie=UTF8&psc=1). I get 1500rpm with only 22.4 db. The increased airflow with far less sound was a super plus. I can say that after having had their 100iV2 for about a year now, I would go back to fans only. The whole point of the liquid cooling was to decrease fan noise, but with 2-3 fans running through a radiator, it's not really worth it. I got just as much cooling from a fan-based CPU cooler. Were they PWM fans and if so did you try messing with the fan curve? I had to tweak mine as I was able to get the fans to spin slower than the presets and still get low temps. That's also with an overclocked i5. Haha, what?! I bet you're cooling an OCed quad-core because you can't cool any other OCed CPU with more cores with just a fan-based cooler. I've seen plenty of people cooling OC'ed 8700k's with noctua d15. Isnt't pump strength & quality a more significant factor than radiator surface area in these AIOs? Why was so much of that article devoted to the lighting?